Now a great time to start having a better lawn - Compost boosts the life in your soil. Rich compost rejuvenates tired, weak soil. Your lawn and trees will thrive with organic compost. Earthworms dig it too! Healthy soil grows better grass and plants in your yard with less insect and disease problems like Take All Root Rot and Brown Patch. Compost gets results since it feeds the microbes and earthworms that make nutrients availble in the soil. Get results. Our Denton based Earth Kind Services provides an organic solution to enrich your soil to have a healthy, green lawn. 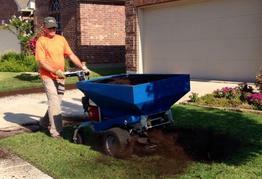 Our unique service is to apply Organic Compost as a Lawn Top Dressing using professional spreaders. In summer we can also apply a special turf blend soil mix at a double rate that can fix minor leveling issues . We also offer a Complete Soil Nutrition Program which consists of 1) Top Dressing and 2) Regular Organic Soil nutrition (fertilizing) applications through the year whcih have over 100+ nutrients, mychorizial fungi, amino acids, & beneficial microorganisms to build the eco sytem of your soil. Feel good about what you put on your lawn that your kids and pets play on. Compost is kid and pet friendly. It does what fertilizing alone can’t, breathing fresh life into depleted soils. The benefits are amazing: Grass roots grow deeper and denser. Bare spots in grass fill in due to rich nutrient environment. Save money by using less water, have less lawn insects and lawn disease problems such as TARR (take all root rot) and Brown Patch with healthy soil. Compost feeds the soil microbes & earthworms that release nutrients, relieving compaction and thatch problems. The soil food web needs diversity of fungus, bacteria, and other living things in your soil to feed your plants. 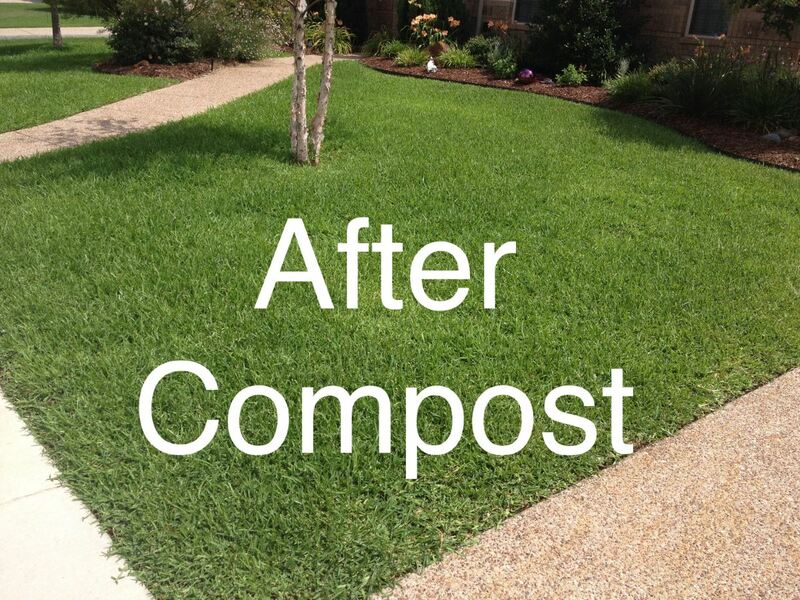 Whether you use organic lawn care and organic fertilizer or synthetic products your landscape will get long term benefits from our Organic Compost Lawn Topdressing. Spring & Fall are excellent times to have compost spread on your lawn as a complement to your lawn fertilizing program. Lawn core aeration before the compost will allow it to go deeper into the soil profile ( if you don't have a company to do this we can refer one). We have special blends for sports fields and soccer fields such as 50/50 blend of fine compost and sand. In Summer we can apply the 50/50 mix to your lawn at a "double rate" for rich nutrients and to build 1/2" layer of soil. Compost over-seeding is an alternative to hydro-seeding, which provides more organic matter to new seedlings and retains moisture for their growth. Schedule for lawn renovation: Fall- we seed Fescue grass. Spring & Summer -we seed Bermuda and Buffalo grass when temperatures are warm enough, as well as any native grasses or wildflowers. We can also do soil prep for sodding where we incorporate 1” compost into the soil by roto-tilling and/or bring in soil to fill in low spots caused by erosion. When done we can also install sod : St.Augustine, Bermuda, & Zoysia. On existing lawns we can provide lawn leveling to fill in holes and divots that develop over time. Delivery and spreading is also available for Dyno Dirt, Dyno Soil, Plano Pure, Texas Pure Topdressing, Native Hardwood Mulch. In North Texas the soil really benefits when adding organic matter. We use compost that is fully composted for 6 to 12 months. There is no bad smell when we apply it to your lawn. Click on FREE ESTIMATES tab and we will contact you with an estimate or to get more information. We are a local company from Denton and we are not a franchise. Thank you for supporting local business. Earthworms really dig our compost. 12/5/2108 Everyone is so professional and does a great job. I am so pleased with the work I have had done. 9/20/2108 Earth Kind Services is a customer satisfaction and results driven lawn Care company. I have used Earth Kind Services soil top-dressing products for three years. My St. Augustine lawn is thick, weed free and requires water only every 7 days. 11/14/2017 Friendly caring staff with outstanding service! 11/14/17 good service well done job. 11/10/2017 Prompt, cool equipment.... all worth it. No more breaking our backs, may do this more regularly. 11/10/2017 Great job, and super personnel. Knowledgeable of the product and very thorough. 11/6/2017 - Friendly people who are knowledgeable. Technologically up to date by electronically providing quotes, invoice, and receipts. Recommended by top notch arborist. 10/20/2017 - Easy to order, prompt communications, great product. 9/24/17 - 2 years ago I began using Earth Kind Services compost to top-dress my lawn (mixture of fescue and St. Augustine grasses) and I am seeing overall results, especially in my troubled areas where grass was not growing. I have also noticed a resurgence of earth worm and other beneficial insects. 9/22/17 - Beau & Carrigan were very helpful in helping me understand the benefits and process of spreading compost on my lawn. Eloy and his coworker were very thorough and professional in performing the service. Thanks! 9/15/17 - Service was very professional. This is the second time I have used Earth Kind Services and have been very satisfied with the results. Beau, I am so impressed with the improvement of the compost laid in July. The dry and brown patches became grassy again and the grass everywhere just looked more lush. Can't believe I didn't have to re-sod to fill in those spots! I'm definitely a believer that compost is great for the yard and I plan to do it every year. 9/27/2018 Earth Kind saved my yard a year and a half ago and has since made it look fabulous, in spite of the fact the neighborhood rabbits love my yard. Highly recommended. 12/5/2018 I had never seen a worm in my yard or on my walkways before! Your advertising always says your topping makes worms happy, now I have proof that I have some! Eloy did such a fantastic job again for me today! Great guy! 1/31/2019 From the initial phone call to Earth Kind, I was very pleased at how I was treated. They answered all of my questions, and sent a very easily understood quote with what was to be done and how much it would cost. On the day of application of the compost, I was introduced to Eloy, the application tech. He was very personable, shook my hand, and said he was going to get started. He was quick and efficient, and cleaned up when the job was done. North Texas Soils can be challenging. Organic compost is a great solution. Click for more benefits & videos of us in action. Have a naturally healthier lawn. Top dressing with compost is the single most important thing you can do for your landscape. We service the following areas: Denton, Robson Ranch, Harvest, Allen, Alliance, Argyle, Arlington, Aubrey, Canyon Falls, Carrollton, Celina, Colleyville, Coppell, Corinth, Dallas, Double Oak, Flower Mound, Farmers Branch, Fort Worth, Frisco, Grapevine, Harvest, Hickory Creek, Highland Park, Highland Village, Irving, Justin, Keller,Krum, Lantana, Lewisville, Little Elm, McKinney, Northlake, Plano, Providence Village, Ponder, Prosper, Richardson, Roanoke, Robson Ranch, Sanger, Shady Shores, Southlake, The Colony, Trophy Club, University Park, Crossroads, Oak Point, Lake Dallas. © 2018, Earth Kind Services. All Rights Reserved.